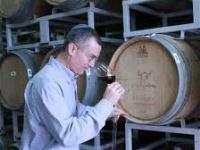 Amichai Luria, winemaker for Shiloh Winery of Israel, is a contradiction of wine making. He shies away from publicity, yet he is famous as one of the best winemakers in Israel. Amichai always had a passion for making wine. When he arrived at Shiloh Winery in 2005, with state-of-the-art technologies at his fingertips and his uncompromising professionalism and expertise, he quickly gained a fantastic reputation. To date, his achievements include several gold medals and international recognition: for his Shor Cabernet Sauvignon 2005, Cabernet Merlot 2005 and also his Gold Medal and "Best Israeli" Chardonnay 2007. His Shiloh Mosaic, was rated a 91 score by Daniel Rogov, and just recently his Shor Cabernet Merlot 2006 received an 88 score by Wine Spectator. In 2011 Amichai made history in Israel, by making Shiloh Winery the first winery ever to make a "Clean Sweep" by claiming the coveted Gold Medal in the Eshkol Hazahav Wine Competition for ALL THREE major categories. Shiloh Secret Reserve Cabernet Sauvignon, Secret Reserve Merlot, and Secret Reserve Shiraz, were all awarded Gold Medals at the same time, proving Amichai's abitily to work with many varieties, and consistently provide great wines and great value for his customers. Amichai's single greatest pleasure is simply sitting back and watching, while others enjoy Shiloh Wines.